All Rights Reserved · Unauthorized use and/or duplication of this material without express and written permission from this site’s author and/or owner is strictly prohibited. Excerpts and links may be used, provided that full and clear credit is given to Jonathan Franklin and Phillip Melchers, owners and creators of BaRPG, with appropriate and specific direction to the original content. 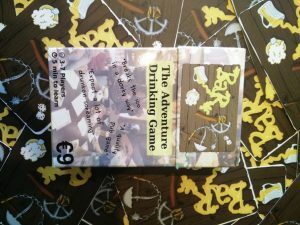 Welcome to BaRPiG – The unholy result of a one night stand between card-based role-playing games and a mostly ridiculous party. Nederlands vertaling hier verkrijgbaar! Wanna try out the original BaRPG first? Or join us at one of our upcoming Events and try BaRPiG out for yourself with the creators!